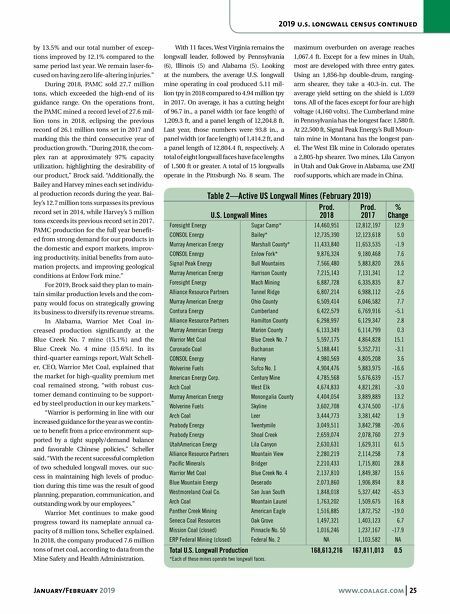 January/February 2019 www.coalage.com 25 2019 u.s. longwall census continued by 13.5% and our total number of excep- tions improved by 12.1% compared to the same period last year. We remain laser-fo- cused on having zero life-altering injuries." During 2018, PAMC sold 27.7 million tons, which exceeded the high-end of its guidance range. On the operations front, the PAMC mined a record level of 27.6 mil- lion tons in 2018, eclipsing the previous record of 26.1 million tons set in 2017 and marking this the third consecutive year of production growth. "During 2018, the com- plex ran at approximately 97% capacity utilization, highlighting the desirability of our product," Brock said. "Additionally, the Bailey and Harvey mines each set individu- al production records during the year. Bai- ley's 12.7 million tons surpasses its previous record set in 2014, while Harvey's 5 million tons exceeds its previous record set in 2017. PAMC production for the full year benefit- ed from strong demand for our products in the domestic and export markets, improv- ing productivity, initial benefits from auto- mation projects, and improving geological conditions at Enlow Fork mine." For 2019, Brock said they plan to main- tain similar production levels and the com- pany would focus on strategically growing its business to diversify its revenue streams. In Alabama, Warrior Met Coal in- creased production significantly at the Blue Creek No. 7 mine (15.1%) and the Blue Creek No. 4 mine (15.6%). In its third-quarter earnings report, Walt Schell- er, CEO, Warrior Met Coal, explained that the market for high-quality premium met coal remained strong, "with robust cus- tomer demand continuing to be support- ed by steel production in our key markets." "Warrior is performing in line with our increased guidance for the year as we contin- ue to benefit from a price environment sup- ported by a tight supply/demand balance and favorable Chinese policies," Scheller said. "With the recent successful completion of two scheduled longwall moves, our suc- cess in maintaining high levels of produc- tion during this time was the result of good planning, preparation, communication, and outstanding work by our employees." Warrior Met continues to make good progress toward its nameplate annual ca- pacity of 8 million tons, Scheller explained. In 2018, the company produced 7.6 million tons of met coal, according to data from the Mine Safety and Health Administration. With 11 faces, West Virginia remains the longwall leader, followed by Pennsylvania (6), Illinois (5) and Alabama (5). Looking at the numbers, the average U.S. longwall mine operating in coal produced 5.11 mil- lion tpy in 2018 compared to 4.94 million tpy in 2017. On average, it has a cutting height of 96.7 in., a panel width (or face length) of 1,209.3 ft, and a panel length of 12,204.8 ft. Last year, those numbers were 93.8 in., a panel width (or face length) of 1,414.2 ft, and a panel length of 12,804.4 ft, respectively. A total of eight longwall faces have face lengths of 1,500 ft or greater. A total of 15 longwalls operate in the Pittsburgh No. 8 seam. The maximum overburden on average reaches 1,067.4 ft. Except for a few mines in Utah, most are developed with three entry gates. Using an 1,856-hp double-drum, ranging- arm shearer, they take a 40.3-in. cut. The average yield setting on the shield is 1,059 tons. All of the faces except for four are high voltage (4,160 volts). The Cumberland mine in Pennsylvania has the longest face: 1,580 ft. At 22,500 ft, Signal Peak Energy's Bull Moun- tain mine in Montana has the longest pan- el. The West Elk mine in Colorado operates a 2,805-hp shearer. Two mines, Lila Canyon in Utah and Oak Grove in Alabama, use ZMJ roof supports, which are made in China. 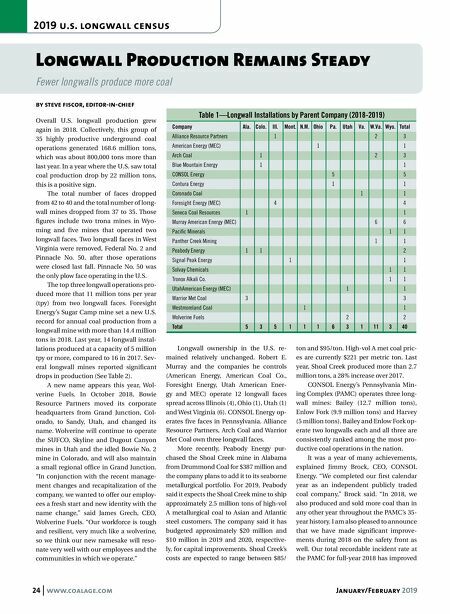 Table 2—Active US Longwall Mines (February 2019) Prod. Prod. % U.S. Longwall Mines 2018 2017 Change Foresight Energy Sugar Camp* 14,460,951 12,812,197 - 12.9 CONSOL Energy Bailey* 12,735,390 12,123,618 -0 5.0 Murray American Energy Marshall County* 11,433,840 11,653,535 0 -1.9 CONSOL Energy Enlow Fork* 0 9,876,324 0 9,180,468 -0 7.6 Signal Peak Energy Bull Mountains 0 7,566,480 0 5,883,820 - 28.6 Murray American Energy Harrison County 0 7,215,143 0 7,131,341 -0 1.2 Foresight Energy Mach Mining 0 6,887,728 0 6,335,835 -0 8.7 Alliance Resource Partners Tunnel Ridge 0 6,807,214 0 6,988,112 0 -2.6 Murray American Energy Ohio County 0 6,509,414 0 6,046,582 -0 7.7 Contura Energy Cumberland 0 6,422,579 0 6,769,916 0 -5.1 Alliance Resource Partners Hamilton County 0 6,298,997 0 6,129,347 -0 2.8 Murray American Energy Marion County 0 6,133,349 0 6,114,799 -0 0.3 Warrior Met Coal Blue Creek No. 7 0 5,597,175 0 4,864,828 - 15.1 Coronado Coal Buchanan 0 5,188,441 0 5,352,731 0 -3.1 CONSOL Energy Harvey 0 4,980,569 0 4,805,208 -0 3.6 Wolverine Fuels Sufco No. 1 0 4,904,476 0 5,883,975 -16.6 American Energy Corp. Century Mine 0 4,785,568 0 5,676,639 -15.7 Arch Coal West Elk 0 4,674,833 0 4,821,281 0 -3.0 Murray American Energy Monongalia County 0 4,404,054 0 3,889,889 - 13.2 Wolverine Fuels Skyline 0 3,602,708 0 4,374,500 -17.6 Arch Coal Leer 0 3,444,773 0 3,381,442 -0 1.9 Peabody Energy Twentymile 0 3,049,511 0 3,842,798 -20.6 Peabody Energy Shoal Creek 0 2,659,074 0 2,078,760 - 27.9 UtahAmerican Energy Lila Canyon 0 2,630,631 0 1,629,311 - 61.5 Alliance Resource Partners Mountain View 0 2,280,219 0 2,114,258 -0 7.8 Pacific Minerals Bridger 0 2,210,433 0 1,715,801 - 28.8 Warrior Met Coal Blue Creek No. 4 0 2,137,810 0 1,849,387 - 15.6 Blue Mountain Energy Deserado 0 2,073,860 0 1,906,894 -0 8.8 Westmoreland Coal Co. San Juan South 0 1,848,018 0 5,327,442 -65.3 Arch Coal Mountain Laurel 0 1,763,202 0 1,509,675 - 16.8 Panther Creek Mining American Eagle 0 1,516,885 0 1,872,752 -19.0 Seneca Coal Resources Oak Grove 0 1,497,321 0 1,403,123 -0 6.7 Mission Coal (closed) Pinnacle No. 50 0 1,016,246 0 1,237,167 -17.9 ERP Federal Mining (closed) Federal No. 2 NA 0 1,103,582 NA Total U.S. Longwall Production 168,613,216 167,811,013 0.5 *Each of these mines operate two longwall faces.